I have a new obsession with vintage french bistro chairs. Of course mine are neither french nor vintage, but instead newly purchased from Kmart. I snatched the last couple from the summer clearance section and painted them white. They were originally turquoise, so I did a thick paint job with a brush to try and mimic wood grain and give it some character. I also switched out my table centerpiece for this old metal caddy found thrifting filled with mini white pumpkins, and sitting on a red striped grainsack. A lone cinderella pumpkin sitting on a freshly painted bistro chair makes a simple display. I am enjoying the changing of the seasons and the beauty it brings, I hope you are too. keep primping & happy fall! P.S. Come back Monday for a great giveaway! Soo excited you went back and found some more! I love my white ones as well as my green ones too- and went back for a few more after the makeover myself ;) Aren't they just fantastic little chairs? I am loving them. So versatile to use indoors and out! Michele I adore this time of year!! 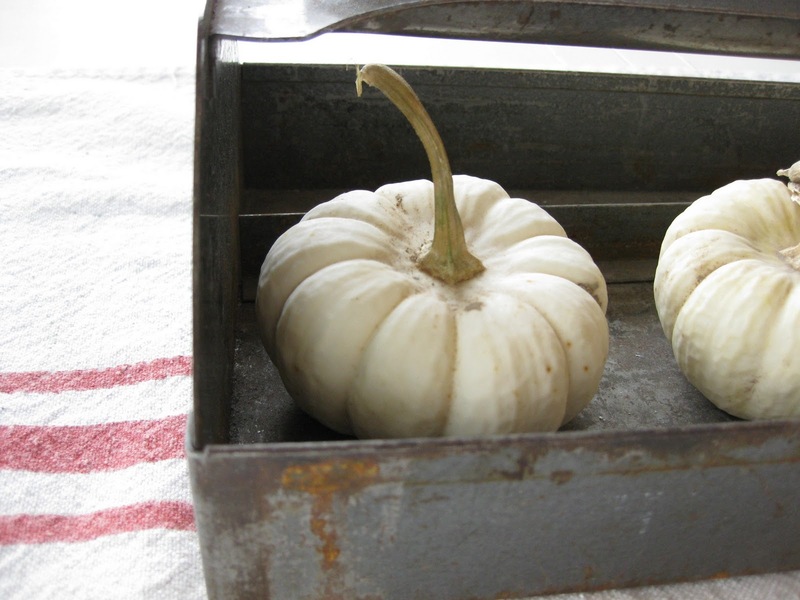 Your white pumpkin centerpiece in the caddy is wonderful. I really love the bistro chairs! Your chairs look fabulous! !I love the caddy. Those little bistro chairs look so wonderful all painted white and shabbied. Perfect for display and creating a shabby french cottage look. Great Kmart find! They look perfect! 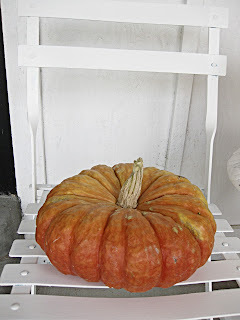 fabulous results and they look just adorable with your collection of pumpkins. couldn't be cuter! Great chairs and oh so fabulous! Fantastic chairs. I think they are so versatile! I know they are popular right now. I have Bistro Chair Love too... I find them to be beautiful, functional and comfortable. I am fortunate to own some Vintage ones from France... and I am glad that the popularity of the Style now has also made it possible to find great modern versions at affordable prices. Love that look. Great find and great REDOUX! Ahhhhhh, don't you just love Fall? I love pumpkins. I love the chicken feeder..Funny..I just bought one yesterday.. Fantastic chairs. I'll have to stop by K-Mart to see if mine has any left. 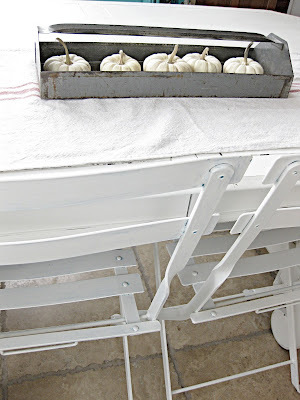 Lovely work with the chairs, and I love the metal caddy with white pumpkins. Fabulous! Your chairs look great...I too love bistro chairs and have them scattered all about my home. Kmart? Seriously?? I haven't been to a Kmart in years because there isn't one close by but it looks like I should make a drive! Gorgeous paint job on the chairs. I love them white. Great inspiration photos. I'm visiting from WW. what is it about bistro chairs? they are just so charming! great job staging them, too! 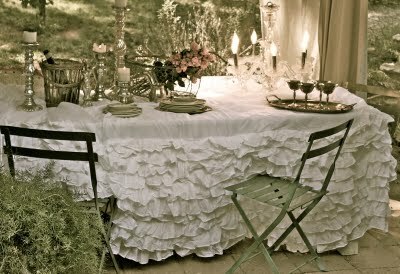 What a great table setting. Cozy and simple. I'll be over at nine!! I love your k-mart bistro chairs. 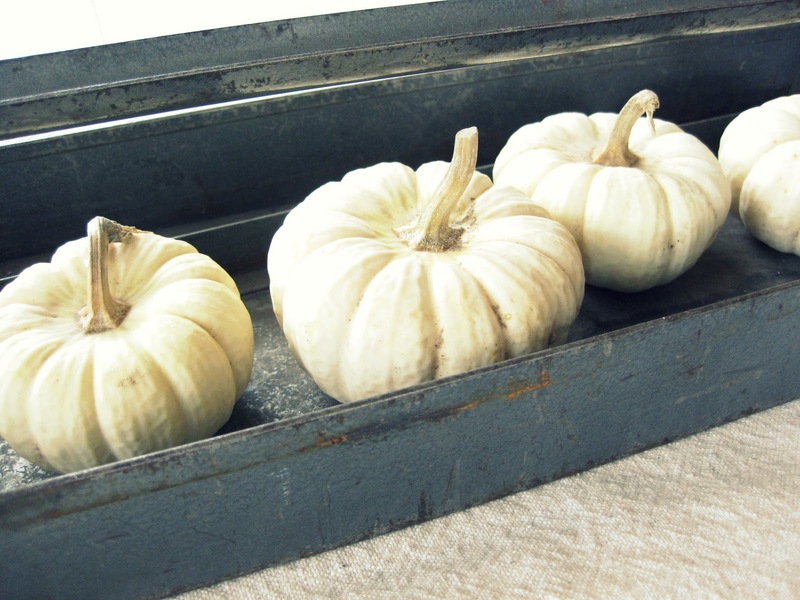 You made them look just right ... and so perfect for your Autumn display. Thank you for the inspiration! so so charming, michele! i love your styling! Your chairs look great. I have some from Ikea and I think they are in need of a new paint job because I love the way yours look. 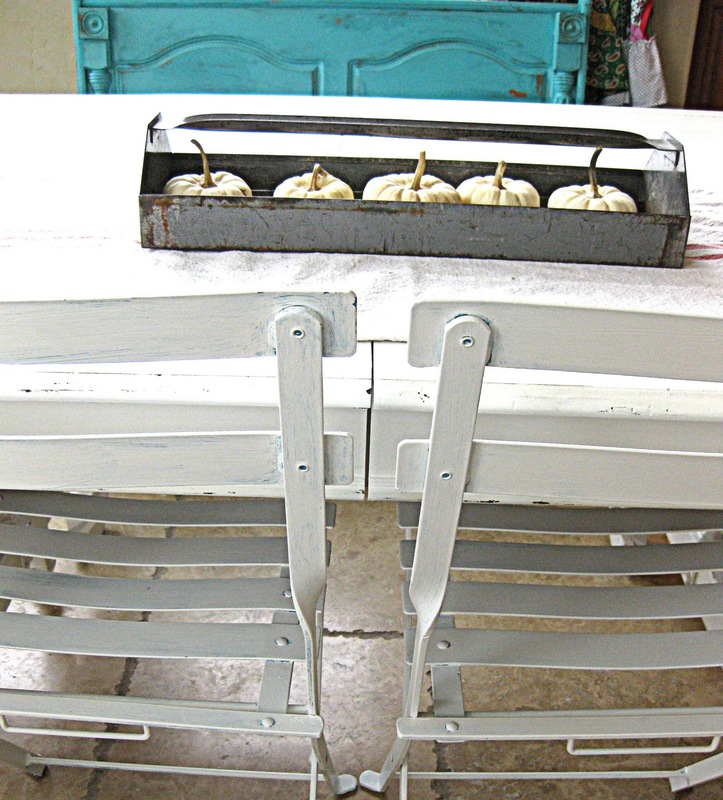 Your bistro chairs look just beautiful and way to go snatching up the last ones! :-) Thanks so much for sharing this at Inspiration Friday this week! Nice job on the chairs. They look great with your fall touches. Improvising to create a look is often the best way to go! So pretty!! I just found you and I'm off to read some old posts. Hi Michelle, love your chairs, wonderful photo! Courtney from French Country Cottage got hers at Kmart too, I got two white ones on clearance for $5 each, last year, and have two older ones I love they've patina'd nicely. Love your inspiration pics too, and you did a wonderful job on your chairs. And guess what? The longer you have them, the lovelier they'll look. 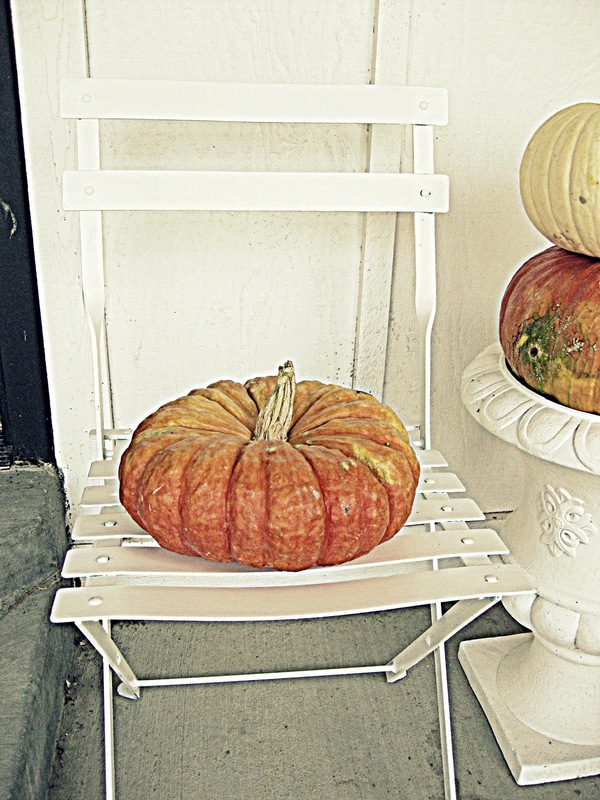 I love the simplicity of the chairs and the pumpkins for a splash of color! Looks great! I did some pumpkin painting this year, didn't pair them with chairs...but I love the look! beautiful! lucky score! kmart?! how awesome!! beautiful images, Michele. they look vintage. Bistro chairs are on my wishlist! Love the photo with the cinderella pumpkin! Wow your I am super impressed with K-Mart. Those bistro chairs are amazing and of course once you added your magic they are just beautiful. 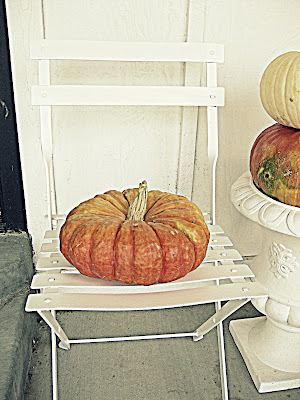 i love the pumpkin sitting on the chair. Fabulous idea! Love the bistro chairs! I have one vintage one and I don't allow anyone to sit on it for fear it will break. These are a great idea for the look and you can sit on them, too! I feel like it may be too late to have them at our kmart but I might have to check! Visiting and now following from FNF. 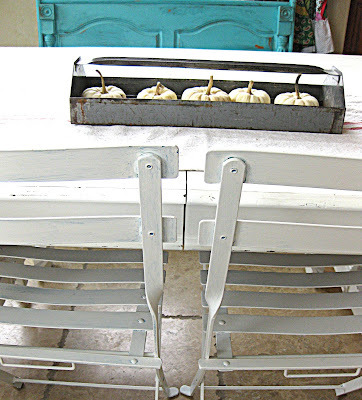 Love all of those cute bistro chairs! Your chairs, so bistro-ish! The paint looks great and I love anything piece of furniture that's versatile. Having a smaller home I need everything to be versatile and easily used. Would you please post this at my 1st Sunday's Best Party. You need to share! LOVE the chairs!! They look great. Would you mind adding my button to your link party list? Thanks a million!